Blowout Sale! Save 54% on the Ousum Non Stick Silicone Baking Mats Set of 4 Pack Heat Resistant 16 1/2'''' x 11 5/8 Professional FDA Approved Food Silicone by Ousum at My Beautiful Cake. MPN: 43235-205011. Hurry! Limited time offer. Offer valid only while supplies last. 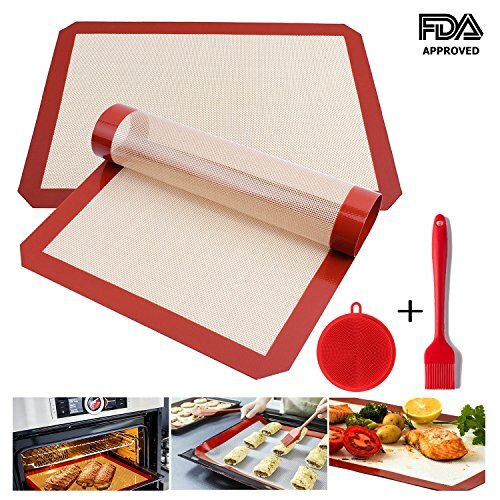 IMPROVED HIGHEST QUALITY HALF SHEET BAKING MAT set of 2 are perfect for making your food preparation, cooking, and baking more fun and much easier. IMPROVED HIGHEST QUALITY HALF SHEET BAKING MAT set of 2 are perfect for making your food preparation, cooking, and baking more fun and much easier. Great for making your favorite cookies and pastries. Wonderful for keeping your kitchen and counters neat and clean when using a pastry brush. DURABLE FOR YEARS OF SERVICE. Use up to 3,000 times baking all your favorites for years or even decades. The non-stick feature means you don't have to use high calorie and cholesterol vegetable oils, sprays, and butter. Ideal for dough workbench, work roll surface board, and also ideal west pot pad. ROLLS UP EASILY for fast and convenient storage. Easy to put away in a cabinet or drawer until needed again. This mat is very versatile as it will withstand up to 450 degrees in the oven and 40 below in the freezer. 100% MONEY BACK GUARANTEE ensures this will be your best bet for a no-risk purchase. Many customers love this big set so much they return to buy one or two more to share with friends. HURRY AND BUY NOW while we have a new shipment in stock. This makes a much appreciated gift for friends, family, and co-workers.